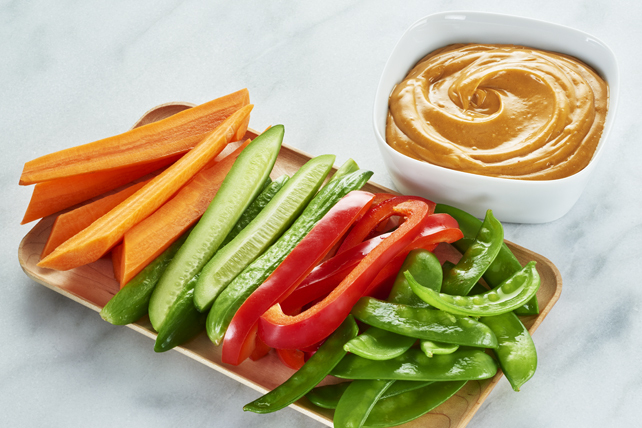 You can't beat this Easy Peanut Sauce that can be served as a sauce, great-tasting dip or stir-fry sauce. Cook all ingredients except vegetables in saucepan on low heat 3 min. or until heated through, stirring frequently. The easy-to-make peanut sauce can be prepared ahead of time. Refrigerate up to 2 days. Remove from refrigerator and let warm to room temperature before using as directed. For a change of pace, serve this flavourful sauce with cooked cleaned shrimp instead of the vegetables. This creamy peanut sauce also makes a great sauce for your favourite stir-fry. Combine sauce ingredients in microwaveable bowl. Microwave on MEDIUM 2 min. or until heated through, stirring after 1 min.